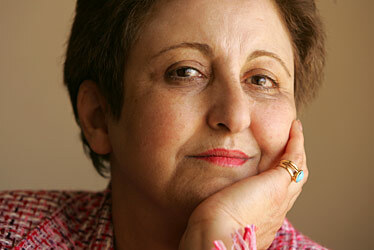 Shirin Ebadi (Persian: شيرين عبادى‎ Širin Ebādi; born 21 June 1947) is an Iranian lawyer, a former judge and human rights activist and founder of Defenders of Human Rights Center in Iran. On 10 October 2003, Ebadi was awarded the Nobel Peace Prize for her significant and pioneering efforts for democracy and human rights, especially women’s, children’s, and refugee rights. She was the first ever Iranian to receive the prize. She was admitted to the law department of the University of Tehran in 1965 and in 1969, upon graduation, passed the qualification exams to become a judge. After a six-month internship period, she officially became a judge in March 1969. She continued her studies in University of Tehran in the meantime to pursue a doctorate’s degree in law in 1971. In 1975, she became the first woman president of the Tehran city court, and also the first ever woman judge in Iran. On 10 October 2003, Shirin Ebadi was awarded the Nobel Peace Prize for her efforts for democracy and human rights, especially for the rights of women and children. The selection committee praised her as a “courageous person” who “has never heeded the threat to her own safety”. This entry was posted in Women and tagged Awards, Top-Posts, women. Bookmark the permalink.